The big twins of western Kentucky, Kentucky Lake and Lake Barkley, along with Green River Lake and Taylorsville Lake all receive oodles of fishing pressure for the crappie that swim in their waters. However, Kentucky is also blessed with other less known waters holding bountiful populations of crappie that don’t receive the adulation and fishing pressure of their more well known brethren. While known for its excellent largemouth bass fishing, wood strewn 2,315-acre Yatesville Lake in Lawrence County holds good numbers of quality white crappie with many in the 15-inch range. 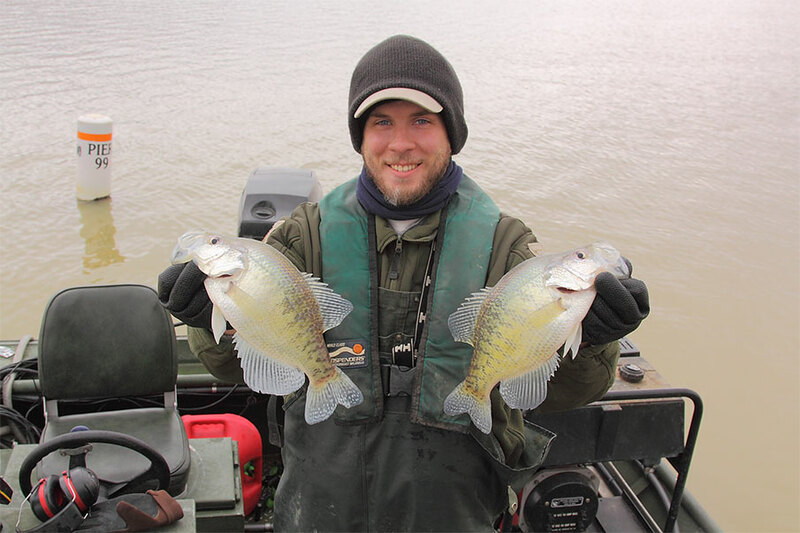 “In our latest population sampling, Yatesville had the most crappie we’ve ever sampled in the 10- to 14-inch range,” said Kevin Frey, eastern fisheries district biologist for Kentucky Fish and Wildlife. Yatesville Lake, near the West Virginia border, more resembles a flatland reservoir with abundant woody cover than a mountain lake. Probe the fallen tree tops and submerged trees with live minnows suspended under a bobber and adjust the depth until you get bites. The timbered coves and banks near the confluence of Blaine and Greenbrier creeks hold crappie. Cave Run Lake is full of 2- to 3-year-old crappie, providing excellent opportunity for both black and white crappie. The deep weedbeds in the mouths of Skidmore and Leatherwood creeks in the Beaver Creek arm attract black crappie in March and into April. Black crappie tend to move into the shallows earlier in the year than white crappie. White crappie stay out in deeper water along creek channels while blacks may be in just a few feet of water along rocky banks at the same time. The abundant woody structures around Bangor Boat Ramp and fallen trees along the island near Poppin Rock Boat Ramp in the North Fork Arm of Cave Run provide excellent fishing for white and black crappie. Tributaries at their confluence with the Kentucky River have abundant root wads, undercut banks and washed in tree tops and brush. Probe all of these with live minnows suspended under a bobber or with 1/16-ounce chartreuse Roadrunner style spinner baits dressed with a matching 2-inch curly-tailed grub. “Another flowing water to consider is the Ohio River. It is really, really good for crappie right now,” Crosby said. The Ohio River offers good crappie fishing from Ashland downstream to the Purchase Region in far western Kentucky. Early spring is a good time to catch large white crappie 11 inches and longer on Barren River Lake in Allen and Barren counties. Known throughout the Midwest and upper South as a superior largemouth bass lake and written up in national magazines, Barren River Lake holds a burgeoning population of black crappie as well, which now make up 60 percent of the total crappie population in the lake. Casting banks composed of pea gravel with lime-green 2-inch curly-tailed grubs rigged on red 1/8-ounce leadheads is a productive presentation for black crappie. Drifting live minnows along creek channels in March and early April fools big white crappie on Barren before they move into the shallows to spawn. The huge snows of just a few weeks ago are now in the dustbin of history. It is time to get out and catch some crappie.